Home » » Media Open Streets! The day-of flyers are out for this Saturday’s exciting Media Open Streets event, with great activities along the route through town, and several at Glen Providence Park! Come out and play in the streets! 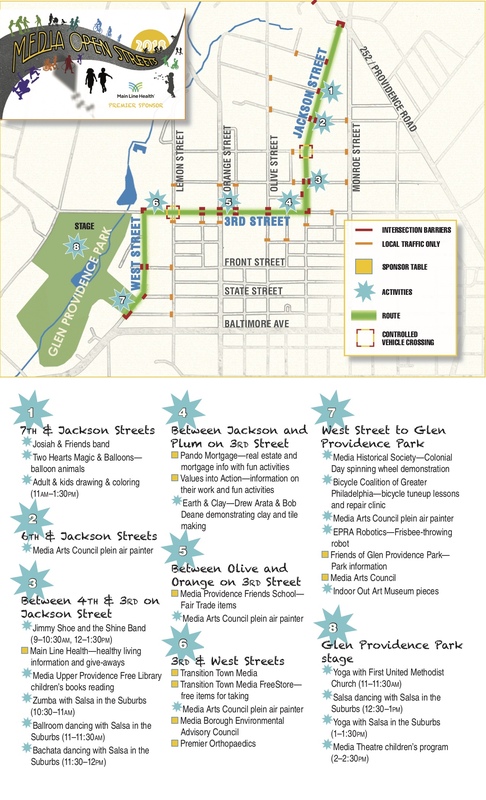 Roads will be closed from 9am to 2pm – on Jackson St. from 252 to 3rd St., 3rd St. from Jackson to West St., down West to State St., and down State to Glen Providence Park. Anything non-motorized is allowed—bicycles, strollers, wheelchairs, skateboards, roller skates, or just your own two feet. There will be food, vendor and information tables, activities, and music along the way! You can check out the activities below, download the Media Open Streets day-of flyer, and check out the event website for more information!